2015 has seen an increasing shortage of goods in Crimea and, with the approach of winter, one sector where this is most acutely felt is healthcare: essential medical supplies are in short supply; major hospitals are even running out of bandages. The range of foodstuffs available in Crimea’s shops has changed completely since March 2014, although products from Ukraine are still getting through (usually by sea across neutral waters). Indeed, suppliers are happy: the mark-up on foodstuffs is higher than on most other goods. No essentials have disappeared, but prices have risen by 30-40% compared to those on mainland Ukraine. According to official figures, the number of private firms operating on the peninsula has fallen from 137,000 (January 2014) to just 22,000 (January 2015). Business people cite a lack of state support in the transition period and problems with distribution as their main reasons for leaving. Crimeans, however, have been able to set up a ‘shuttle’ system for delivering both food products and other essentials, such as medical supplies, from Ukraine. 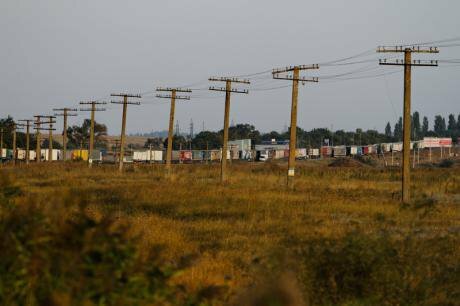 When Ukrainian and Crimean Tatar organisations gathered at the provisional border between Ukraine and Crimea in the mid-September to block lorry traffic, it was clear that prices were going to rise still further. ‘On the first day of the blockade, there were 620 trucks stuck at the border, but they had all dispersed by the third or fourth day,’ Artyom Skoropadsky, one of the demonstrators tells me. Ukrainian medical supply companies say that they were able to deliver their products to Crimean hospitals and pharmacies until summer 2014, despite an unspoken ban on any goods being sold to public bodies in the peninsula. The import of any medical drugs, however, has been impossible since the start of 2015. ‘I’ve never trusted Ukrainian or Russian drugs, or Indian ones either, so I can’t compare them,’ says Maksim, a supplier of medical products to Crimea, who refuses to allow his real name to be used as his contract forbids him to talk to journalists. Regardless, there is no question of protest against the Crimean government, no more marches or rallies. The last protest action planned was to be against Sergei Menyailo, governor of Sevastopol, but it was cancelled under the pretext of holding a concert instead. There are no campaign groups organising protests or pickets, Many civic activists left Crimea after film-maker and local activist Oleh Sentsov was arrested in May 2014. When Crimea was part of Ukraine, medicines were nominally supplied free at health centres, but due to lack of funding people usually had to buy them at pharmacies, or pay market rates for them in hospital. Private clinics also existed, but their numbers fell after the new Russian authorities nationalised them: their buildings and equipment seized by the Crimean government. 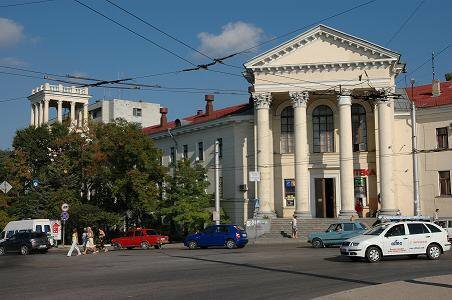 Since the start of 2015, there have been reports of mass radiography machines no longer working: the Feodosiya and Yevpatoriya regions could no longer afford to repair them, as all replacement parts had to be bought in Ukraine. The main problem remains, however, the lack of essential drugs in pharmacies and getting them to Crimea. Sevastopol's central Pirogov hospital. CC WikiMediaCommons.Yekaterina Kovalyova has lived in Sevastopol for 50 years. Her son moved to Kyiv after annexation, so now whenever she visits him she brings medicines back for her friends. ‘I couldn’t believe it until I saw it for myself,’ says Yekaterina. ‘The medicine I needed wasn’t from Denmark, but produced under licence in Russia. I took it for four days, it didn’t help. I went to the pharmacy again, bought the same stuff—this time made in France and three times the price—and that has worked. That wasn’t much of a bother, the main problem is antibiotics: they didn’t check luggage at the border before, but now they check everything, and I have to bring an enormous amount of medication. I have four different diagnoses and no border official is going to get their head round all my prescriptions. Another problem for residents of Crimea has been the transition to the Russian health insurance system, where medicines are free. But doctors, including specialists, are resigning or losing their jobs to cuts. To get a referral to a specialist, you need to first get an appointment with an ordinary doctor, and even that’s not easy: ‘There are enormous waiting lists to see doctors,’ Yekaterina tells me. ‘I needed a cardiologist, but when I arrived at the health centre it turned out he’d resigned. There are four doctors to cover 14 neighbourhoods. It was never like this before.’ You can now wait five hours to see a doctor. April 2014: Russian health minister Veronika Skvortsova visits the Central Black Sea Hospital in Simferopol. (c) Taras Litvinenko / VisualRIAN. Life isn’t easy for people needing post-operative medication either. I talk to Vladimir, 60, Sevastopol born and bred, on Skype—he recently had an operation to remove part of his thyroid gland. Not all stories end happily, however. Vitaly works as a computer programmer in Kyiv. He moved there from Crimea long before annexation, but his pensioner parents stayed on in Sevastopol. Two months ago, Vitaly’s father took ill, but was misdiagnosed. He didn’t receive the right treatment and he died. The first thing Crimea demand is free treatment under the state health insurance system. If they don’t get the services they need, they phone the ‘Aksyonov hotline’ (named after Sergei Aksyonov, prime minister of the Crimean government), and complain about the doctors. The doctors get a reprimand, the patients – an answer on a printed form. 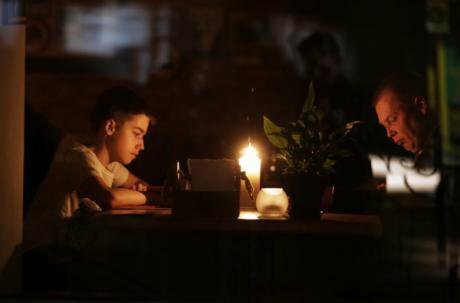 On 22 November, Crimea's power lines to mainland Ukraine were cut, leaving the peninsula in darkness. Max Vetrov / VisualRIAN.Crimea’s Ministry of Health puts the number of medical specialists working on the peninsula at 44,642. But its bureaucrats admit that they lack enough doctors: there are currently 860 unfilled posts, whilst the number of patients using the system has risen by 25% in comparison with last year. The authorities, however, do not admit to medicines being in short supply. Doctors working in Crimea say that supplies of Ukrainian medicines began to run out long before the blockade, when suppliers in Ukraine broke their contracts with the peninsula’s pharmacies and hospitals without any explanation. Though hospitals still had some supplies in their stores, officials suddenly started organising ‘raids’ to find and seize them. Since 2010, Ukraine had been receiving medical supplies from international NGOs as part of ‘humanitarian aid’, and some of them were stored away in case of emergencies. But now Crimea, as part of Russia, no longer receives any aid and all medical supplies must come from Russia, or at least be registered in Russia. ‘The “raiding parties” consisted of hospital staff, led by the senior nursing officer,’ Dmitry (not his real name), a doctor with 10 years of experience at Sevastopol’s central hospital, tells me. According to Dmitry, the system for delivering medical supplies to Crimea has still not been sorted out. Often a patient will start taking one antibiotic, and then the hospital will run out of it and he or she will be given a different one. ‘People in Crimea don’t always realise how difficult their position is, and that “free healthcare” doesn’t guarantee you’ll get the right medication in hospital,’ says Dmitry. ‘Shortage’ (defitsit) is an everyday word for doctors in Crimea. ‘Even dressings and bandages are in short supply. Deliveries by sea are unreliable. You have bandages, cotton wool gloves and antiseptics for barely a week, and they need to last a month,’ the doctor tells me. Diagnosis is also complicated by a lack of essential equipment and tests. Testing for and treating allergies, for example, is not done as well as it used to be. Immunolog, a company based in Vinnitsya, central Ukraine, produces diagnostic allergens for use in prick tests and for allergen-specific immunotherapy. Now patients have to get hold of the allergen kits themselves, but it’s an almost impossible task. Multiple electric poles that serve the Russian-annexed peninsula have been detonated on the Ukrainian mainland. (c) Sergii Kharchenko / Demotix. Cancer specialist Vitaly works in a state hospital in Crimea’s capital Simferopol, and he is careful about criticising Russian medications. He admits there is a problem, but doesn’t see it as a serious one. In early 2015, the UN discussed the deaths of seven drug-dependent patients in Crimea. They had been receiving drug replacement therapy in the form of methadone and Buprenorphine since 2005. In Russia, this form of treatment is illegal, and rehabilitation relies on detoxification. There were 803 users registered on Crimea’s drug replacement programme, and after annexation they lost access to methadone. Some left Crimea and continued the programme in Ukraine, some went back to using hard drugs, and some died. Now, at the end of 2015, there is no Crimean organisation openly keeping a record of drug users’ deaths. Crimea’s authorities are refusing, however, to reveal to the press the number of drug users from the discontinued methadone programme who have died this year. The peninsula now has the For a Sober Crimea Foundation, an NGO that organises therapeutic camps for drug users, providing them with psychological support during detoxification. The organisation tells me that up to 15 people contact the foundation every month. Unfortunately, the treatment the organisation offers isn’t free: many users and their families simply can’t afford it. After the peninsula’s main power lines were cut on 22 November, however, when unknown individuals blew up pylons near the Ukrainian border with Crimea, and hospitals are now facing a survival scenario. Some departments are working on back-up generators, and doctors are treating people in the dark according to some patients I’ve spoken to. Diagnostic procedures and operations are now delayed. But in Crimea there’s children and adults who depend on ventilation machines to survive: volunteers from Moscow are assisting, though, with the purchase of reserve generators. According to information from Crimea’s government, the authorities are planning to fix the problem before the middle of December. Sources involved in building the Russian state’s ‘electricity bridge’ over the Kerch straits believe that the power cuts will continue into summer 2016—even after the bridge comes online. 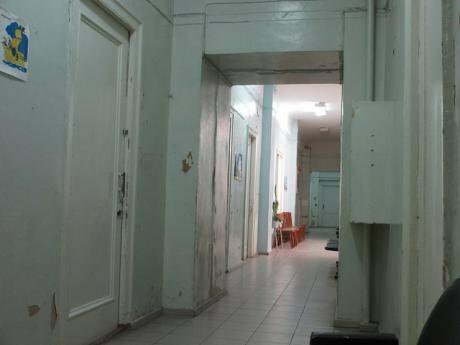 Standfirst image: Kostyrno psychiatric hospital, Kerch. laura ilyina / flickr. Some rights reserved.